“The Hunger Games: Mockingjay – Part 2” builds on the momentum of each previous chapter in the blockbuster series to reach a fever pitch of both emotion and action, bringing Katniss full circle from the dismayed girl caught in a dystopian nightmare to leading the charge to remake her nation. Ayala Malls Cinemas’ complements the momentous finale with their various promos for cinema patrons. 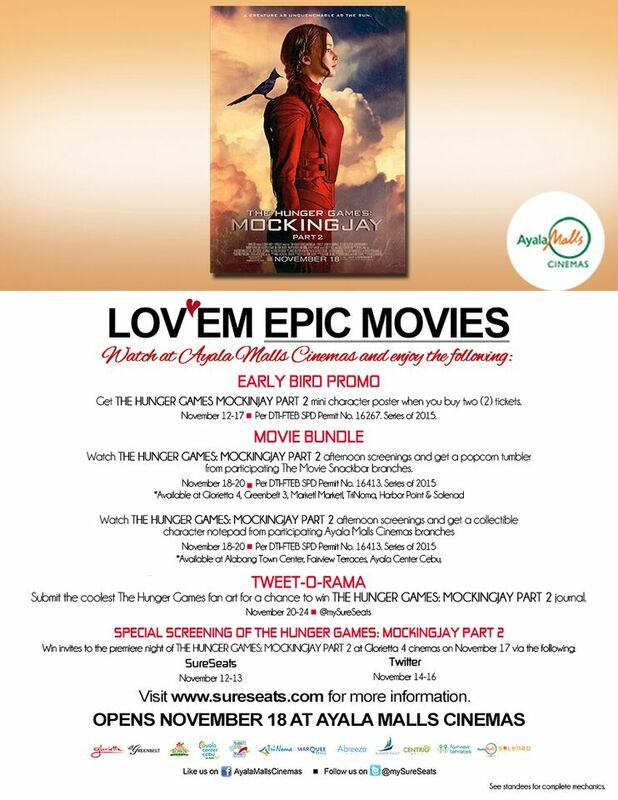 Check out the following promo offered by Ayala Malls Cinemas. Please also log on to www.sureseats.com for schedule and ticket reservation. “The Hunger Games: Mockingjay Part 2” will open November 18 in cinemas from Pioneer Films.